C.S. Lewis is most known for the Narnia Chronicles. J.R.R. Tolkien is known for the epic Lord of the Rings. Charles Williams wrote a total of seven novels, including “War in Heaven” and “All Hallow’s Eve”. 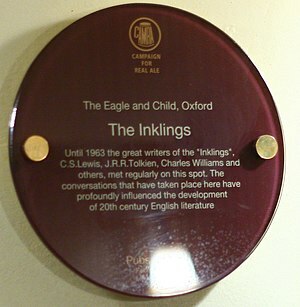 The Inklings usually met at Lewis’ college rooms or at the Eagle and Child pub (popularly called the Bird and Baby) in Oxford England. Meetings took place on Thursday evenings. They would read and talk about each other’s works in progress, discuss fantasy and philosophy, and enjoy the company of friends. The pub meetings were more for fun; they wouldn’t read manuscripts, but sometimes read bad poetry to see how long they could last before laughing. The group started in 1933 and met regularly for the next 15 years. Everyone benefited. Tolkien continued to work on Lord of the Rings at the encouragement of C.S. Lewis. Each writer improved their work from suggestions by other members. Their discussions led to essays, lectures, and other works in the attempt to legitimize fantasy and fairy tales as more than children’s stories, to be seen as liable literary pieces. Writers can find similar benefits in today’s writing groups, whether you join an existing one or create your own, online or in person. Friendships can be made when you find someone with similar interests. Sharing work will improve your writing and critiquing skills. Or perhaps you only want to discuss literature. The Inklings showed that a writers group doesn’t have to always be serious, or have any sort of leadership. All it takes is a group of people with something in common. Next time I’ll talk about my own experiences with writing groups, and how you can find your own. So if you ever happen upon this quest in game, enjoy the developers tribute to the Inklings. Next time on Mary’s Expression (Feb 20): Delving deeper into writing groups.